drifts the snow of that left unspoken. from your eye or your mouth or your ear. that is free to drift with the flakes. This is a poem by Paul Celan translated from the German original by Michael Hamburger. The original was written in the early 1950s. Its title is the first line. We assume a translation is second-hand and only the original can provide definitive clarification. But clarification of what? Isn’t our sense of the opacity of translation also the sense of the rebuffing wind in Celan’s poem? Searching for the key to this poem, and being resisted, we sense the climate the poem reports. As we watch the snow gathering, pursuing an answer to explain why Celan chose this particular key – and there are grim details one can point to – prompts only a return journey to the poem. It is an uncomfortable fact that the bar to a poem’s key – this poem’s key – is the key to the poem itself. Some might dismiss this as tiresomely reflexive; a poem about poetry. It is clear, I think, that this is an insensitive reading. The metaphors are too close to experience to dismiss it as abstract. Indeed, can they get any closer? Celan’s friend, the French poet Yves Bonnefoy, wrote: I believe that Paul Celan chose to die as he did so that once, at least, words and what is might join. He had drowned himself in the Seine in late April 1970, six months before his fiftieth birthday. What is Bonnefoy talking about? Surely death by drowning and words are as far apart as one can get? Bonnefoy is alluding to his friend’s peculiar linguistic heritage and how it affected his life and poetry. Celan was grew up in the city of Czernowitz, then part of Romania, now within Moldova. Its political geography meant many languages were spoken among its inhabitants. In the poet’s home, the language was High German, while the wider community generally used the more latinate Romanian. There were many others in circulation, including Yiddish. The last is significant as Celan was part of a large Jewish community. There was anti-Semitism, for sure, but German culture was the pinnacle of Western civilisation. It promised something better than feudal sniping. Inspired by his mother’s deep love for it’s poetry, he wrote lyric poems in the tradition of Hölderlin and Rilke. It is said that as a youth he had a remarkable affinity for it too. His taste moved him toward the contemporary symbolist and surrealist movements, and despite his polylingual abilities, he always wrote his poetry in German; his muttersprache. Then war came. Celan was, by chance, separated from his parents on the day the Nazis arrived and deported the city’s Jews. He never saw his parents again. They were taken to a Ukrainian labour camp. His father died of disease; his mother was shot. After this, as Hugo Gryn said, Celan was in the position of being a writer in the language of his mother and of his mother’s murderers. He could not renounce the latter’s language without renouncing the former’s. Celan was robbed of his parents’ death as well as their lives. Bonnefoy implies the same goes for his müttersprache. So for Bonnefoy, an avowed Christian, another death becomes another metaphor of hope. If his explanation is exemplary, we remain in what Maurice Blanchot calls “the civilisation of the book”, where literature takes possession of everything – that is, submitting it to a pre-established unity symbolised by the enclosing covers of a book. Even Bonnefoy’s sensitive appraisal leaves too strong a trace of the dubious correlation of life and art. Its presence allow us to keep the discomposing reality at a distance, within the inexorable logic of a narrative with a beginning, middle and, most importantly, an end. This article on Celan will tend toward that logic too. Perhaps it must. But whereas the industry surrounding Sylvia Plath, for example, regards the poetry as an expert witness to judging the case of her tormented life and suicide, with Celan, this would be to miss everything. “the poet’s need [is] to get beyond ego in order to become the voice of more than autobiography. At the level of poetic speech, when this happens, sound and meaning rise like a tide out of language to carry individual utterance away upon a current stronger and deeper that the individual could have anticipated.” (Note the pervasive river theme!). If any help is needed, the line “a grave in the air” can be read as the smoke rising from the camp chimneys; plain fact as much as metaphor. Overall, the poem emerged from reports of small Jewish orchestras playing tangos within concentration camp fences, often accompanying gravedigging and executions. The poem mimics the pace and rhythm of the dance that had captivated carefree Europe between the wars. Its first title was indeed ‘Death Tango’. In placing such lightness within the realm of such darkness, an entire culture is incriminated. The change to ‘Deathfugue’ recalls the divine lightness of Bach, while ‘Margarete’ alludes to the tragic heroine in Goethe’s Faust, forgiven by God despite everything. (It is a bizarre but telling fact that Goethe’s famous oak tree outside Weimar was protected by the SS as the Buchenwald concentration camp went up around it.) Margarete is contrasted with Shulamith, the female symbol of Jewish hope in the Song of Solomon, who is not forgiven. In post-war Germany the poem became part of the curriculum for schools and was acclaimed by numerous critics in the new Federal Republic. However, praise tended to be for what was called the poem’s “mastery” of what had passed – the Holocaust; enabling a reconciliation of sorts. Germany wanted to move on. It welcomed the rising tide out of language as it bore guilt away. The worst was confirmed when schoolteachers discussed the use of the poem in class. They agreed it was excellent in teaching how poetry might follow a musical pattern like a fugue but, they felt, the teaching should not be side-tracked by talk of the Holocaust. 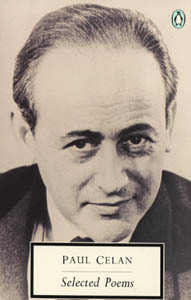 Celan’s subsequent distress led him to refuse to perform readings of the poem again. Perhaps he also felt there was a tendency toward the dark romance of a ‘terrible beauty’ in its aesthetic effects. Above all, it faced the progressive movement of the civilisation of the book, enveloping discordance like the resolving refrain of a Beethoven sonata. Celan does not offer the facts. Poetry is something else, something more than the facts. But, in general, that ‘something else’ remains under suspicion even more than the dehumanising facts because ‘something else’ seems to be only self-regarding gymnastics with a dictionary. Indeed SPIKE quite rightly announces itself to be “violently prejudiced” against poetry. What is the alternative? Celan’s poetry is an answer. The polemic is striking and memorable, but for that reason perhaps begs the question: how does one turn a word heavenward? Isn’t this a rhetorical gesture? Celan’s title for the collection in which the two quoted poems appear is “From Threshold to Threshold”, and this just about sums up the “failure” of these two poems to cross the threshold to heaven. As readers we tend to grasp moments of manifesto-like clarity such as these; but assertion is not enough. Despite its practical matter-of-factness, it betrays failure. This is not to criticise. Failure is central to the history of modern poetry, although such failure is now usually misunderstood. To simplify, the concern of the Romantic-Enlightenment poets of the 18th Century – the beginning of the modern age – was humanity’s relation to nature. We are familiar with this in Wordsworth and Coleridge. In the greater Europe, Hölderlin’s inspiration was also “To be one with all that lives, and to return in blessed self-forgetfulness into the All of Nature“. While he pursued it in poetry, others, such as his friend Hegel, turned to philosophy. But where philosophy feeds off distance, allowing the goal of the Absolute – which would be the end of philosophy, the end of history etc. – to be preserved indefinitely as a self-aggrandising rhetorical device, poetry demands the end without delay: if poetry remains, distance remains. Where today’s celebration of nature uses language in an unironic slideshow of clichés (see any New Age CD, website or poetry book made of recycled paper) the Romantics recognised only failure: words, corpses. He speaks but only just. It is poetry with aphasia. How might a man speak of this time, this ‘destitute time’, as Hölderlin called it, without using destitute words? Celan renews the question. If for every Hölderlin there is a philosopher like Hegel, then for Celan there is Martin Heidegger. His analysis of the modern age had a profound influence on Celan’s work, offering a theoretical apparatus to his own poetic one. Simplistically, Heidegger sought a new mode of thought to counteract the mechanistic tendency of the modern world. He believed that humanity had become separate from its harmony with the rest of nature, as he believed was in place in Homer’s Greece. This separation was due, he thought, to the rise of dualistic ways of thinking set in motion by Plato. Concentrating on the concept of ‘being’, Heidegger argues that ‘human being’ is not a thing like other things (objects in the world as we know it) but a clearing (a non-thing, a nothingness) in which those things are presented, where they actually become things. And rather than this being an argument for solipsism (the world as function of one’s mind), it means our knowledge of the world is not a product of boxed-in consciousness. Instead of minds making thoughts possible, it is the ‘being’ preceding mind that makes it possible for us to regard ourselves as minds having thoughts distant from ‘the real world’. This is a major challenge to the Cartesian tradition that has dominated Western thought for the last four centuries. But the clearing depends on a temporal and linguistic aspect. Things appear in the three dimensions of time, enabling us to categorise it in language and so differentiate it from the rest of the world. Such categorisation, however, is restricted by our need for control, and so the thing disappears from view. We become blinded to the discourse of the world; to what is revealed. The world becomes an object. This is a necessary tendency but one that can and must be counteracted by the function of the clearing. “Today, everywhere … remaining reality is disappearing in the mire of a “globalised” world. Nothing, not even the most obvious phenomena, not even the purest, most wrenching love, can escape this era’s shadow: a cancer of the subject“. This is not a conspiracy of others but a runaway part of our need to live in the world rather than be imprisoned by autism. Selflessness, of course, while admirable in most cases, can also descend into what we called inhumanity. One of the terrible ironies of this story is Heidegger’s own descent. In the early 1930s, he saw the Nazi party as a political movement capable of mediating the needs of the modernity with authentic existence, making Germany a modern-day equivalent of ancient Greece. In 1933, the Rector of Freiburg University, where Heidegger was a renowned young professor, resigned in protest at Hitler’s anti-Semitic laws. Heidegger took his place after an election among the Aryan lecturers. He soon resigned in disaffection but never revoked his party membership and referred to his regret for the Holocaust only in what Maurice Blanchot called ‘scandalously inadequate’ fashion. Such facts make Celan’s interest in his work more compelling. Heidegger represents the dangers inherent in the Romantic project. Another example would be the terror following the French Revolution. What does this mean for poetry? Well, in his isolated time after the war, during his denazification, Heidegger came to believe poetry was the means to open up the world; it could rouse the revelation of things in the clearing. In fact, it was the revelation itself. His intense meditations on Hölderlin’s poetry is summarised by an essay title taken from a poem: “… poetically man dwells …”. Elsewhere he wrote that “Language is the house of Being. In its home man dwells. Those who think and those who create with words are the guardians of this home.” If that is the case, and poets tend to feel it is, then it means, following the catastrophe of the Holocaust, language would have to change in order to rebuild the tainted home. In the post-war era, this was an imperative for Celan as he was now living in Paris as a translator and tutor, physically and metaphorically exiled from his homes: Czernowitz, under Soviet rule, and German, under the weight of “murderous speech” as he called it. It was an imperative because, as his Paris contemporary Samuel Beckett put it: one writes not in order to be published, one writes in order to breathe. Celan could not breathe in the old language. The old language was saturated with the conditions by which an entire culture was able to produce the greatest art and thought in history and then produce death camps with the efficiency of a factory. No wonder Adorno said that to write lyric poetry after Auschwitz was itself barbaric. no one conjures our dust. Praised be your name, no one. the nothing-, the no one’s rose. One can draw neither comfort nor despair from this poem, or rather, neither of them alone. It is a psalm and an antipsalm; sacred and bitter. What stands apart is palpable only in its absence; a void saturated by void, to use Blanchot’s phrase. Celan’s biographer John Felstiner has brought out the allusions within ‘Psalm’ to Jewish and Christian mysticism, both of which has to be bypassed here. But, to repeat Eliot on Dante, I think it communicates before any of these allusion are understood. It may seem paradoxical that the writer of such a poem as ‘Psalm’ has a biographer (Heidegger says the author of every masterful poem is unimportant) and Felstiner’s book does indeed concentrate on the poems. Despite this, he uncovers the probable origin of the title of his 1959 collection “Sprachgitter” – Speech Grille. Perhaps the ‘strange’ can be used no longer because it is already too familiar, too homely. He had to seek another word or phrase: “the altogether other”. His speech, as much as his poetry, has to be attuned to the demands of experience. Celan also refers to the attempt to give each poem its own date, its own unique time, so that it speaks with supreme accuracy. The strong clocks justify the splitting hour hoarsely. You , clamped into your deepest part, climb out of yourself for ever. This is puzzling, but such puzzlement does not matter much once one sets the need for facts or conclusive harmony aside. Less sympathetic critics dismiss his work as ‘hermetic’, sealed from approach. They say only the writer could know what such a poem is about. Why is the world illegible? What is a strong clock? I have no answers. Perhaps the lack of a title necessitates a certain blankness in the initial response. The moment one titles an experience the dangers lessen. Would a biography help us understand this? Probably not. Celan was adamant that his poetry was accessible: “As for my alleged encodings” he said “I’d rather say: undissembled ambiguity. I see my alleged abstractness and actual ambiguity as moments of realism.” It seems odd that a poet so keen – perhaps even desperate – to reach across time, to provide us with such realism, should do so by writing wilfully unreadable poems. Perhaps we shouldn’t be so quick to assume it is the poetry’s problem. Professor John Carey of Oxford would disagree. He is Britain’s foremost opponent of difficulty. In his best-selling book ‘The Intellectuals and the Masses‘, he argues that Modernism – the epitome of difficulty – was invented by intellectuals in order to alienate the so-called masses, who, newly emancipated from illiteracy, were seen as muddying the pure waters of literature. Celan indicates other reasons. In fact, the ‘enjoyment’ Carey demands is really a means of retaining a dualistic attitude to literature; of ‘talking eyes into blindness‘, to use Celan’s phrase. Of course, many Modernists were proto-fascists, yet this doesn’t mean difficulty equals Totalitarianism. It means, instead, a ‘crossing through danger’ is not mere rhetoric. The dangers led Heidegger to his great error. It troubled Celan that the man he saw as one of the greatest of modern thinkers, so close to his own work, was a Nazi. One cannot even say ‘had been a Nazi’ because he never said anything that amounted to a renunciation. Late in life, Heidegger became interested in Celan’s work. He recognised him as the only living equal of Hölderlin. He attended public readings given by the poet, and in 1967 even invited him to his famous Black Forest retreat at Todtnauberg. Celan accepted. This was a significant move as Celan had developed an intense sensitivity (one might say ‘anxiety’) toward anti-Semitic tendencies in post-war Europe. When his dedicated publishers re-issued the work of a poet popular in the Nazi years, he left for another, and when German literary authorities exonerated him over plagiarism charges, he regarded it as a humiliation to be even under investigation. Yet here he was meeting a man in his most intimate home, a home in which, it is said, he had once run Nazi indoctrination sessions. Perhaps Celan never knew the full extent of Heidegger’s culpability. Almost certainly not. The two men walked across woodland each in his isolation: an orchid and an orchid. And the poem remained isolated as far as Heidegger was concerned. He displayed his special copy of the poem proudly to subsequent visitors to the cottage, seemingly unaware of its implications. Perhaps this is enough to indicate the blindness of a man, even one with genius, rooted in his familiar landscape – brought out here in Hamburger’s translation of log-paths as ‘fascine’, a word so close to ‘fascist’, the etymological origin coming, as Joris says, from the Latin ‘fasces’ – a bundle of wooden rods – the symbol of fascism. ‘Todtnauberg’ , therefore, cannot be regarded as a coded accusation, or as a shy expression of bitterness, or sentimental regret, or of pompous self-definition in contrast to a supposed intellectual superior, but rather the very openness Heidegger apparently lacked. As Celan once said: “Poetry does not impose itself, it exposes.” The lack of a second ‘itself’ in this sentence exposes. I enjoyed your piece. So why does Celan, in the original German, and in the Felstiner translation capitalize “No One,” “Nothing” and “No-One’s Rose. I don’t have Hamburger’s translation at hand. Is your version a typo or was it Hamburger’s decision. . Kind of important given my beginner’s reading of Edward Jabe’s take on G-D which seems not unlike Celan’s conflicted one and even Kafka’s, one of Celan’s go-to guys. Consider the light barely seen in the crack of the door at the end of “Before the Law.” Are you familiar with Beth Hawkins important book, Reluctant Theologians: Kafka, Celan, Jabe?